Andrea Liu contributes to our collective glossary-building with an entry on PARTICIPATION, the fifth of seven successive posts on terms associated with social practice, initiated via an open call. The majority of visual artists make their art within a discrete, symbolic private space with an unambiguous dividing line between artwork and viewer. What are the stakes when an artist embeds, utilizes, or activates viewers in an artwork? Is the decision to abandon the distinct dividing line between viewer and artwork an attempt to diffract, diffuse, or defer authorial intention? Is it to resist the artwork’s status as discrete and therefore easily commodifiable? Once we consider the viewer (formally) as part of the artwork, it seems we are in need of a more specific ontology of the viewer. 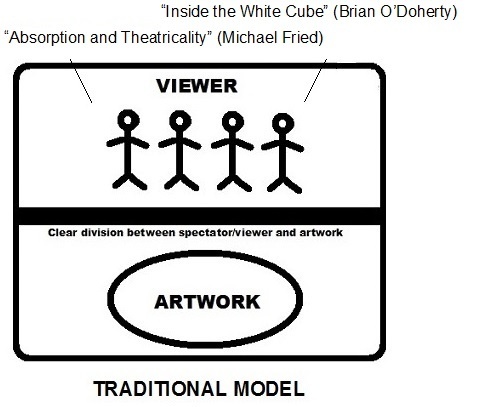 The differences between “viewer,” “spectator,” “public,” “audience,” and “participant” can be parsed along lines that consider the various inflections of agency, purpose, engagement, or orientation. The distinction between a participant who is treated as a token object, as opposed to one whose subjectivity is recognized, seems crucial. 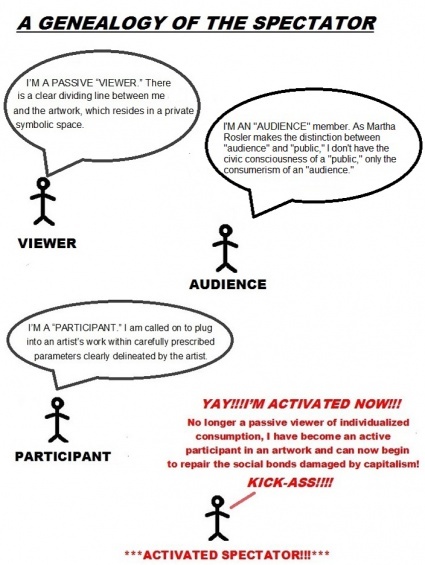 Participatory art and the discourse surrounding it are buttressed by an elaborate ideology, imbued with emancipatory aspirations of militating against an atomized society numbed by individual consumption (à la Guy Debord), rejecting individual authorship in favor of collectivism, championing “active” rather than passive viewers, turning artists into “embedded outsiders” within a nonart community. Whatever the critiques of Artificial Hells: Participatory Art and the Politics of Spectatorship (2012) as being overdetermined, dogmatic, or binary in its pronouncements of “good” and “bad” participatory art, Claire Bishop can be acknowledged for taking on the thankless role of the heretic and giving us a reality check on the grandiloquent ideological aspirations of participatory art. In relation to this polemic, I question whether models of democracy within art can credibly claim to prefigure models of democracy in society at large. 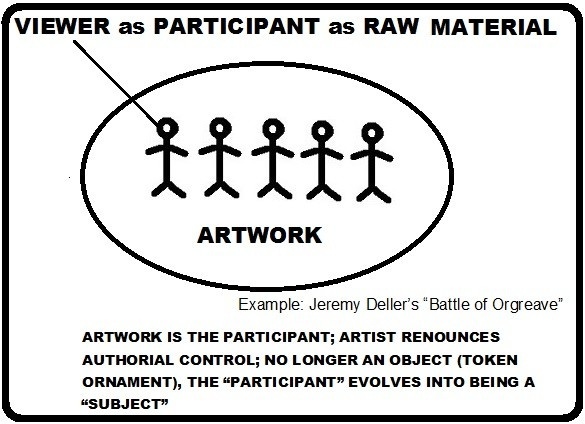 We need to ask how the participant in “participatory art” is conceived: Does he or she co-share power with the artist? There is a danger of a participant being instrumentalized by the artist, giving the illusion of participation to both yet without the participant having any real agency—in some cases the relationship can verge on ventriloquy. If the participant does not in fact have or gain agency by participating in the work, does this lessen the value of his or her participation? 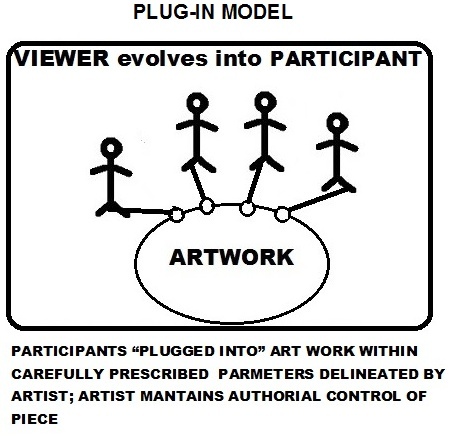 Claims of autonomy within participatory art projects are often belied by their framing by institutions. Is it possible that the democratic aspirations of an activated spectator within participatory art can only find their fullest realization in efforts that are more clearly identified as activism? Roland Barthes’s “Death of the Author” (1967) spurred the “birth of the reader”—in turn we might also consider the “birth of the spectator” and, subsequently, the “birth of the participant.” And yet it is arguable whether the participant of socially engaged art can experience the level of agency or autonomy that Barthes advocated for the “reader.” I wonder, is participatory art, which was originally conceived in opposition to individual authorship and the commodified art object, merely subsumed by neoliberalism’s structures of networks, mobility, project work, and affective labor?